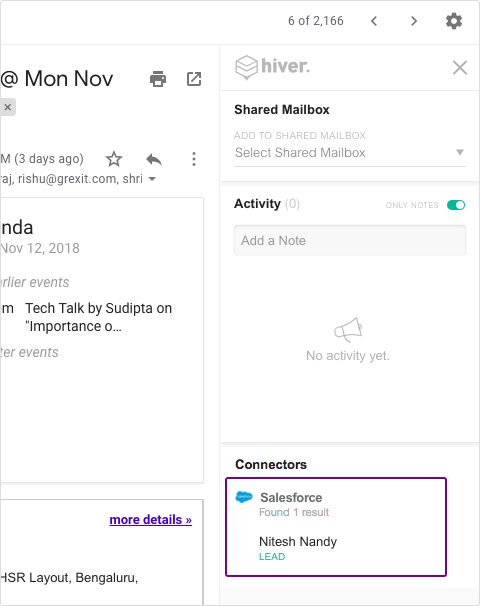 You can connect Hiver to Salesforce, and add people that you're communicating over email with to Salesforce as Leads of Contacts. Hiver Admins will have to enable the Salesforce connector from the Hiver admin panel before you can start using this. Click on Enable for the Salesforce connector. This will then require you to log into your Salesforce account. Your Hiver Salesforce Integration is now ready to use. When you open an email, you will see the Salesforce section in the Hiver right-panel that helps you add a person to Salesforce. By default, this person lets you add the sender of the first email in a conversation to Salesforce. 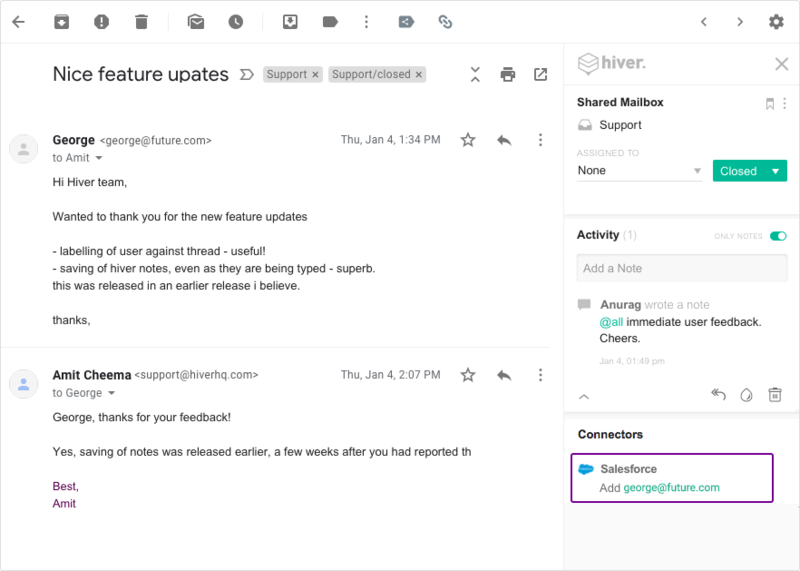 You can take your mouse cursor to any other email address in the email conversation, and the Salesforce section in the Hiver right-pane lets you add that email to Salesforce. In the next step, you can choose whether to add the user to Salesforce as a Contact or a Lead. If the person is already in your Salesforce account as a Contact or a Lead, you see that information in the Hiver rightpane. You can click on the "Lead" or "Contact" text to go to Salesforce and see further details about the person.